Installation at Creighton warns of our greatest resource Watered Down Artist Matthew Dehaemers may not be the first to show “green art” in this area, but his current installation, Watered Down, at Creighton University’s Lied Art Gallery, is one of this year’s most interesting exhibits in Omaha regardless of theme or subject. Sculptor Jess Benjamin and painter/paper artist Susan Knight have long dealt with ecological issues, especially water sources, in a particularly striking yin/yang manner. Benjamin’s earthy, elemental jackstones reference the infrastructure of the Kinsley Dam and the fluctuating levels of Lake McConaughy, and Knight’s abstract “cuttings” and sculptures embody the beauty as well as the delicate balance in ecosystems from the Great Lakes to the Papio watershed. Yet Dehaemers adds something else to the equation as he takes a more hands-on, didactic approach to his socio-environmental concerns, thus placing more conceptual and physical demands on his viewer, long a trademark of this Kansas City-based artist. “I like people to work at it. I don’t think of art as something easy,” he says of his last show in Omaha — the complex, interactive installation, (402)DisConnect/ReConnect at the Bemis Center for Contemporary Arts in 2009. This time he is content to have viewers interact with each work with the aid of his enlightened pamphlet in which he says, “Very rarely do we do the research to find out exactly (where) our water, much like our food, comes from and whether it is safe.” Dehaemers, a Creighton alumnus, has made a career of pubic art projects and artistic service, including a recent commission by the Missouri Department of Transportation and current ones for L.A. County and the Kansas City Area Transit Authority. Though his work consistently reflects a social conscience, his strongest pieces have an arresting aesthetic based upon his imaginative and intelligent eye for design, composition, color and scope. Each accurately describes Watered Down as, despite its self-effacing title, a comprehensive and successful attempt “to bring attention to our most valued and finite resource: water” according to the show’s statement. Unlike Dehaemers’ (402)DisConnect/ReConnect, whose reach at times exceeded its grasp in its efforts to “hook-up” Omaha viewers with its community and its past, this overall installation is remarkably united and focused. It is also a pleasure to behold. Watered Down is composed of seven smaller installations and sculptures that for the most part achieve their goals individually and collectively. In spite of rather academic intent, Dehaemers demonstrates the whimsy and creativity most people begin to express in kindergarten, but which are soon relegated and finally eliminated by the end of formal education. Watered Down resonates because it makes its case with both left-brain (research and evidence) and right brain (imagination). He wastes no time initiating his audience into this cosmic conflict with “Where Does It All Come From?”, more than 100 feet of PVC tubing that snakes from the lobby’s water fountain into the main gallery. By exposing water’s infrastructure, something we take for granted as much as our own systems of veins and arteries, he comments effectively on the impact this diminished, at risk resource has on our own precious bodily fluids. This first installation is “The Ogallala: The Eternal Spring?” It is a structure made of wood, plastic bags, water, cast resin and polycarbonate, which the artist says he modeled after an above ground swimming pool. But this complex structure sports a fountain of plastic water, corn stalks and gasoline nozzles gushing from its aquifer below. The work comments on, among other things, that it takes three gallons of water to create one gallon of corn-bred ethanol. One gets the irony of “The Eternal Spring?,” but does one also appreciate the near ethereal beauty of much of Dehaemers’ structures, a quality he shares with the best area sculptors and installation artists such as Catherine Ferguson and Leslie Iwai? This quality continues with his imposing, satirical “Raise a Glass to Atrazine,” a wall sculpture illustrating the herbicide’s industrial strength and chemical formula plus containers in 3D. 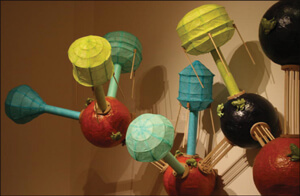 It’s made of papier-mâché balls, brown craft paper, plastic foam and wood. It is so visually striking one is almost distracted from its destructive impact on the environment, and the blind stupidity that has made it “the cheapest, most effective and most widely used herbicide in the United States” despite being banned in Europe. Because Atrazine does not go inert or dissolve in water, it continues to be investigated as it leeches into water supplies in Nebraska and the Midwest. Two additional works, one auditory, one visual, go from the sublime to the ridiculous in contrasting the impact water has on, and in, everyday life. The first, “Every Drop of Life Counts,” is the sound of a drop of water resonating in the venue every 20 seconds; it is to remind us that in the same time a child dies from water-related illness. Conversely, “Water into Wine: What’s It Worth to You?” is a replica of the Baby Bling H20 Bottle, the original which is made by Bling encrusted with Swarovski crystals and sells for $2,600. Also effective is the brilliant in palette and concept, “Ahhh … Matter of Convenience,” a wall installation featuring 3,300 filled water bottles diluted with colored ink. This work speaks for itself about America’s wasteful, spendthrift lifestyle. For good measure, Dehaemers throws in an image of an attractive woman selling this unholy mix of oil and water for the sake of convenience. Stare at the image long enough, in what may be this exhibit’s signature piece and its most stunning commentary, and the Jennifer Aniston look-a-like smiling back at us mirrors Ronald McDonald promoting another “happy meal” for the benefit of our life-in-the-fast-lane, throwaway culture. Watered Down continues through this Friday, Oct. 15 at Creighton University’s Lied Art Gallery, 2500 California Plaza. Visit Creighton.edu/liedgallery .